Complement your home with hand-crafted garage doors by Carriage House Door. Garage doors make up a large part of the charater of any home. Our custom doors add so much warmth and character, we guarantee you will love the way your home looks. 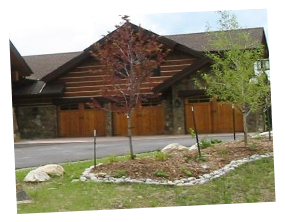 You can choose from one of our many standard designs for your Garage Door or collaborate with us and or your architect to design overhead doors that fit perfectly the style of your home and are an expression of you. Every overhead garage door we craft is insulated whether you choose an all wood door or our high R-Value garage doors which are crafted on a urethane injected steel platform. At Carrage House Door, we use only the finest select hardwoods in our overhead doors. We finish your home garage doors with heavy duty hardware and tracks combined with ultra-quiet operators and steel ball bearing nylon rollers.